Thus is especially cluttered because I was in the midst of moving when I decided to photograph it! Apparently I will do anything to avoid sketching. Knitting swatches for design submissions I am all over that, the sketches to accompany the swatches, not so much. So this is what I am pondering this morning. In our old house I always had this bulletin board above my work space. I considered it an inspiration board. I would cover it with postcards from museums, photos of gardens, tear pages from magazines, as well as the swatches I was contemplating. 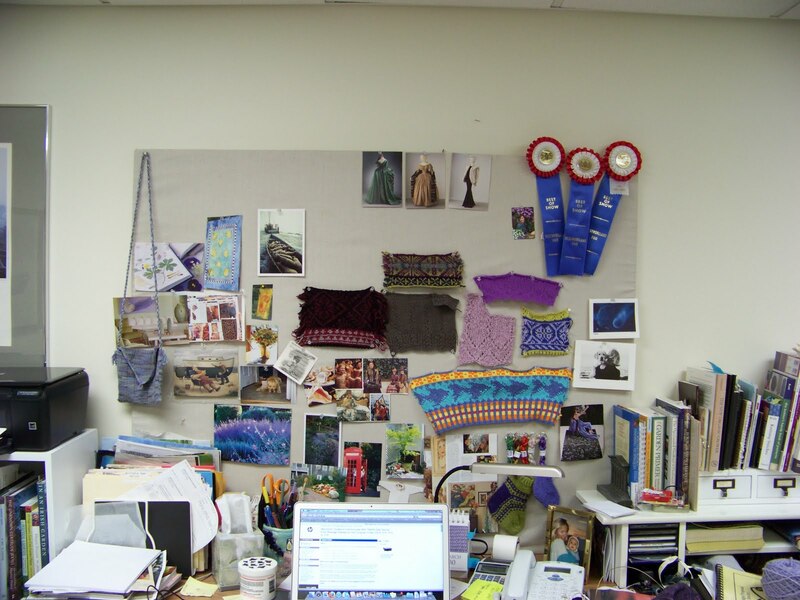 When we moved into our new house, 10 years ago, I thought the inspiration board was too messy and hung it over my sewing table. 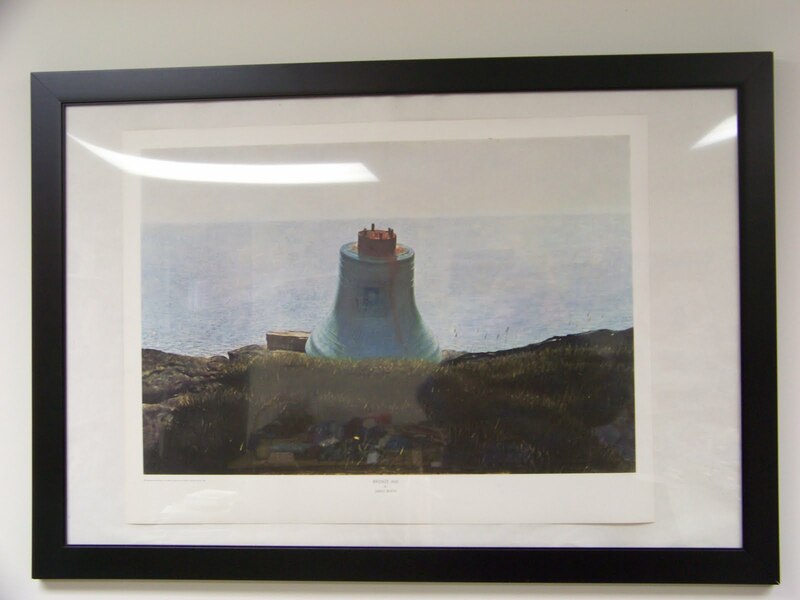 I hung a favorite Jamie Wyeth print of the coast of Maine over my desk. Now here is the rub. 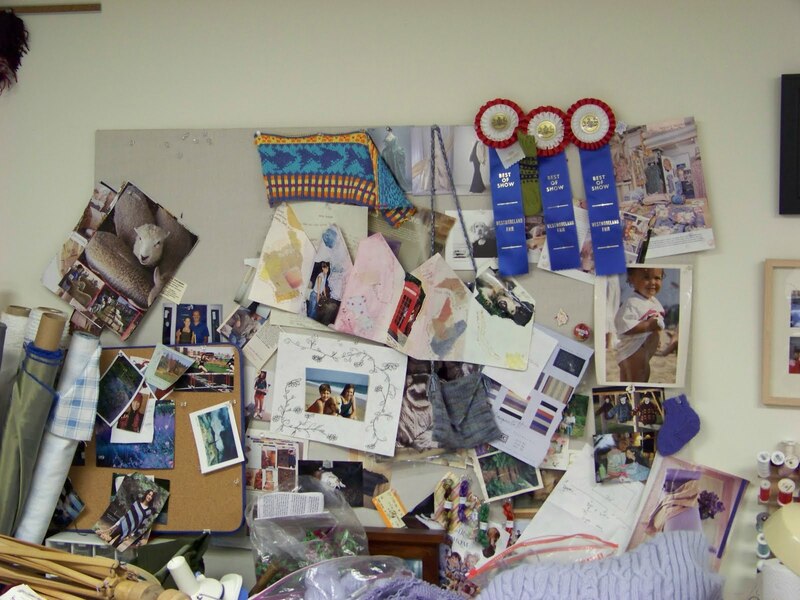 My back is to that inspiration board 90 % of the time I am in my office. I love the Wyeth print with a deep abiding passion, the ocean, the colors, the solitude, they all speak to me. But without my inspiration board I don’t think I feel the push to create at the same level. My swatches are OK. The ideas are being published. But I think I need to stir things up a bit. So rather than get to the sketching I spent thirty minutes changing up the board and print. We will see if this changes the quality of my work. Can’t hurt. Now I feel a little overwhelmed with all the visual clutter in my line of sight. Maybe this wasn’t the best idea. The other ideas I have to increase creativity around here involve moving my office up two flights of stairs and avoiding Facebook. The move needs to happen. I am going quite squirrelly in my basement office without windows. Facebook will have to happen, I just have to wean myself. 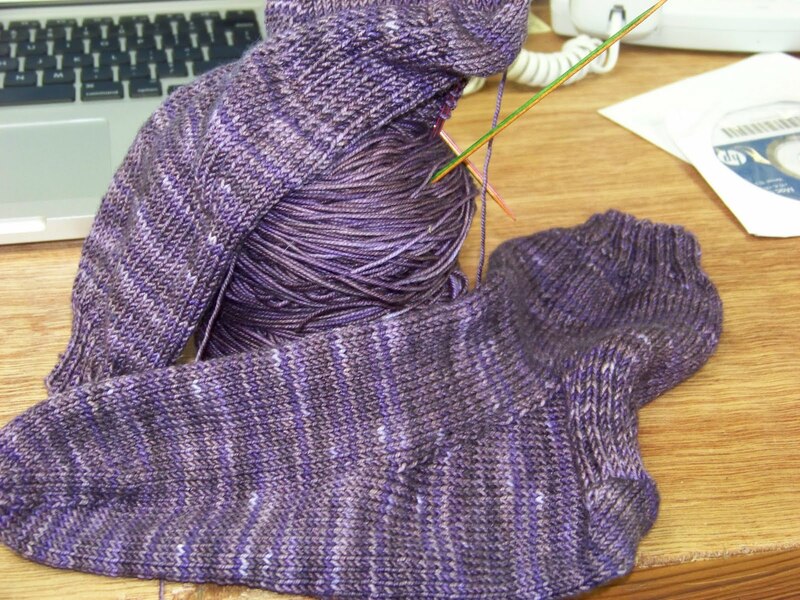 As proof of the sock knitting I talked about earlier I am on my second pair of simple socks. They are pretty boring but oh so warm and cuddily. And I have been working on a new design for a stole for the DD#2 to replace a very pretty shawl I knit for her a few years ago which was unceremoniously stolen in college. It is a delight to knit. The yarn is from Creatively Dyed Yarn, her cashmere and merino, yummy. If it turns out well I will publish the pattern. 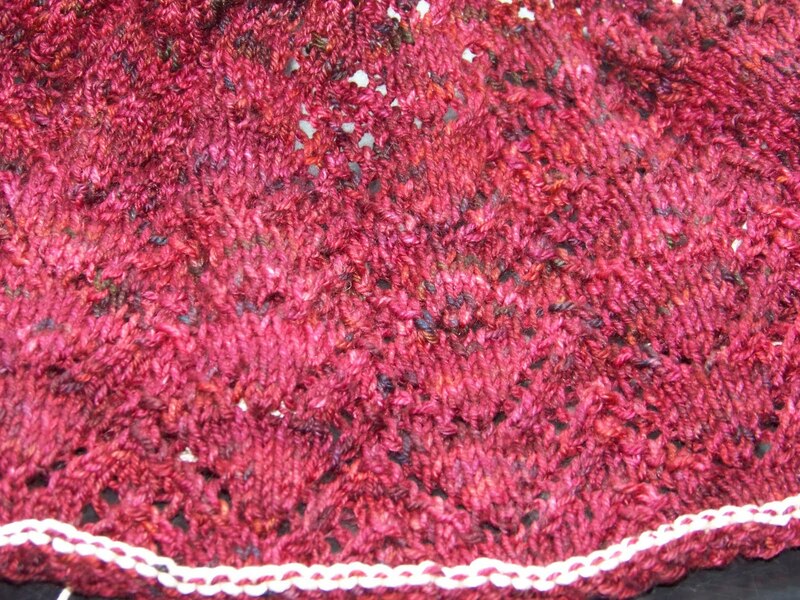 I am very happy with the design and the yarn so can’t wait to finish. We are expecting… for the pattern!